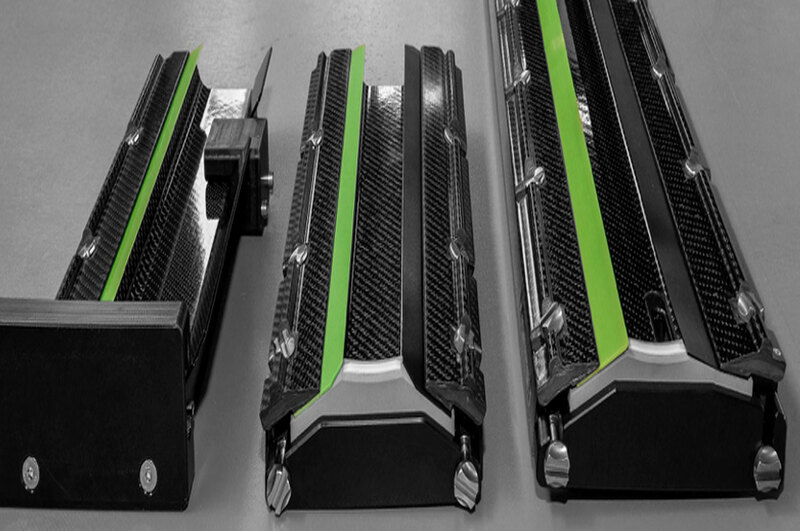 The first Doctor Blade Chamber 100% carbon fiber for flexo printing. Carbon fiber doctor blade chambers produced by Packaging Plast are light, strong and durable with incomparable performance. 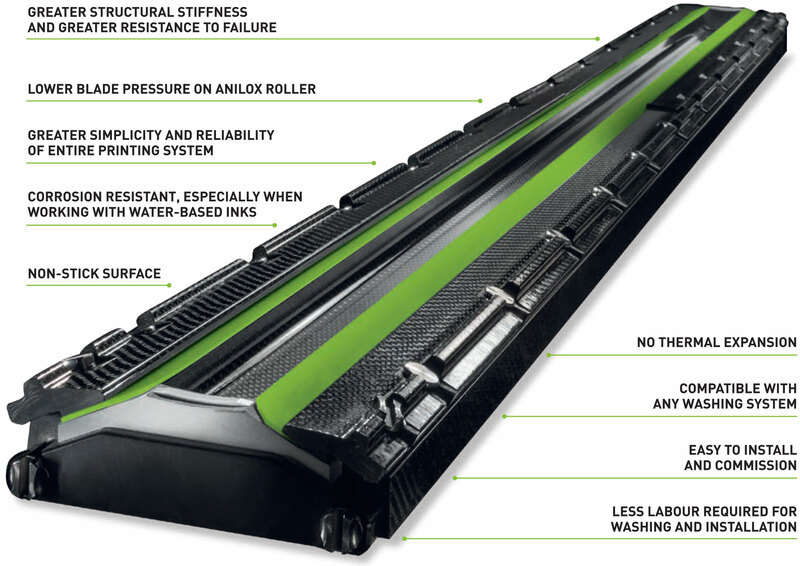 Designed with the intention to optimize print quality and obtain considerable waste reductions. The wall consists entirely of carbon fibre skins that have been securely bonded together. 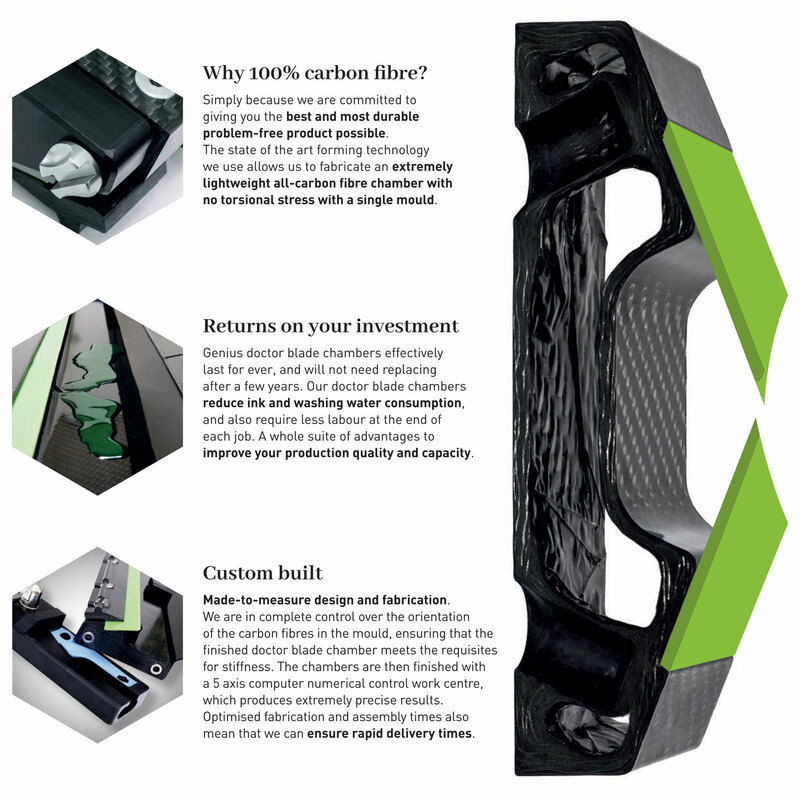 This means that the carbon fibre skins are not laminated together with any material other than carbon. The doctor blade holder pretensioner system uses springs housed in seats incorporated entirely in the moulding of the chamber, meaning that no holes need to be cut into the structure for the pretensioner system. These seats are repeated at fixed intervals along the chamber moulding, conferring extreme stiffness to the system regardless of the length of the chamber itself and irrespective of changes in temperature. The doctor blade chamber cavity is completely hollow. This is achieved by using air bags during the moulding process, which are then removed at the end of the curing process in the autoclave. Packaging Plast doctor blade chambers are made entirely of structural carbon fibre. Other doctor blade chambers have carbon fibre laminated on top of a structure of a different material so the carbon fiber is merely cosmetic. The asymmetric profile produces two different blade contact angles. 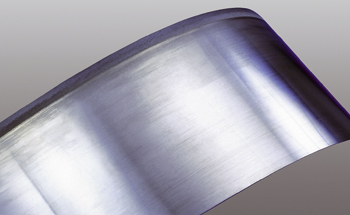 The contact angle of the doctor blade is 32°, while the different angle of the containment blade reduces the angle of incidence of the blade itself on the anilox roller. Symmetric profile, with identical contact angles for both blades, with smaller internal chamber and 6 ink/washing filler points incorporated in the profile. An oversized symmetric profile with a larger distance between the contact points of the two blades, usable to maintain the correct angle of incidence when working with large diameter cylinders. Conceived to cater for the needs of corrugated cardboard printing applications. This profile has a single doctor blade on one side, while the side is usually holding the containment blade is left open. Conceived to cater for the needs of tissue printing applications but is also suitable for corrugated cardboard printing. This profile has a single doctor blade on one side, while the side is usually holding the containment blade is left open. Greater structural stiffness and greater resistance to failure. 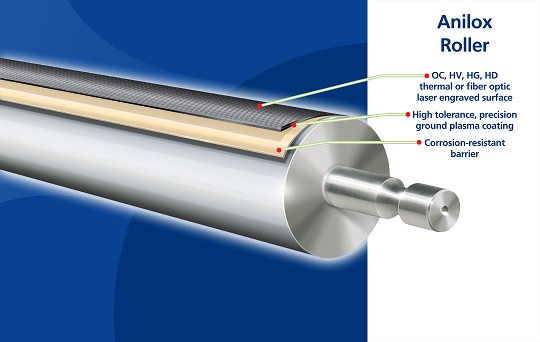 Lower blade pressure on anilin roller. Greater simplicity and reliability of entire printing system. Corrosion resistant, especially when working with water-based inks. Compatible with any washing system. Easy to install and commission. Less labor required for washing and installation.